If you’re familiar with Emily Pitts then you know she’s a paper scrapper with a a very distinctive style that was difficult for me to pull off in digi. Of course, when I think of Emily I immediately think of her large, stacked titles so I knew that would be part of my design. I also used the tips from this tutorial to make the papers look like they were cut by hand. Finally, I have to point out my supply list: only one kit! This pretty much never happens to me, but this kit worked perfectly for my topic. These are pictures that my mom, sister and I shared on a random December day last year. I loved the contrast of bright sunny Maseru with Salt Lake and Seattle. Plus I love pages that document the differences in my family. I use RadLab regularly to process my photos, but almost always stick to the basics like Lights On, Lights Off, Clairefy and Sugar Rush. It was fun to try out other filters for this assignment. I used the “Pool Party” filter because I thought it gave the photo a summery yet retro look. 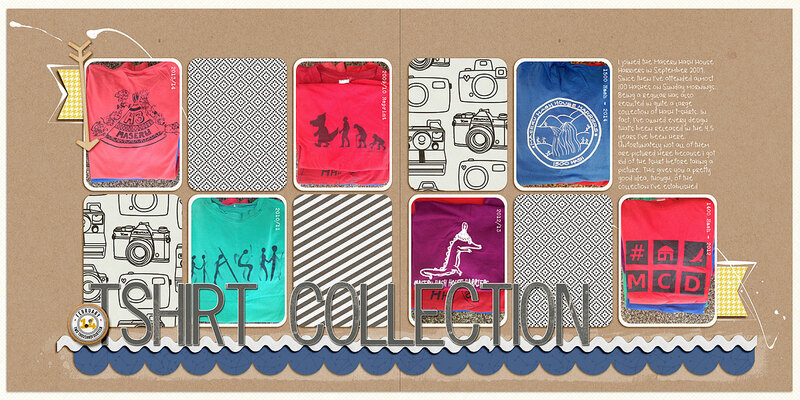 Also, I have to mention how much I love the Surf Lagoon Kit by Katie Pertiet. 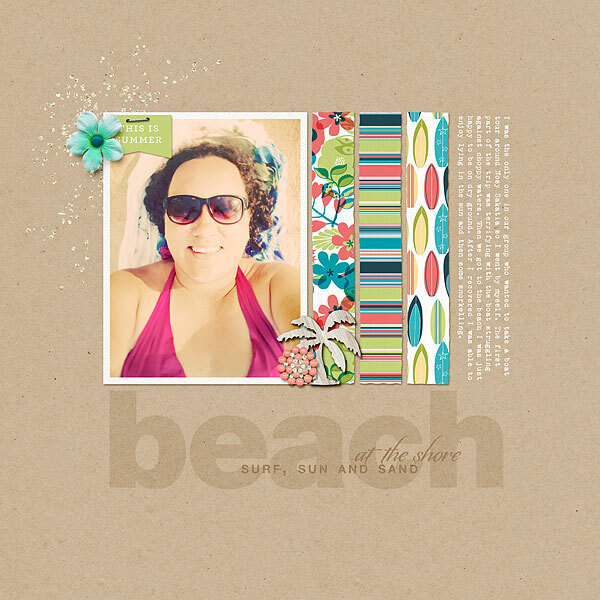 It is my go-to kit for summer/beach pages. This is one of very few kits that I have used repeatedly. 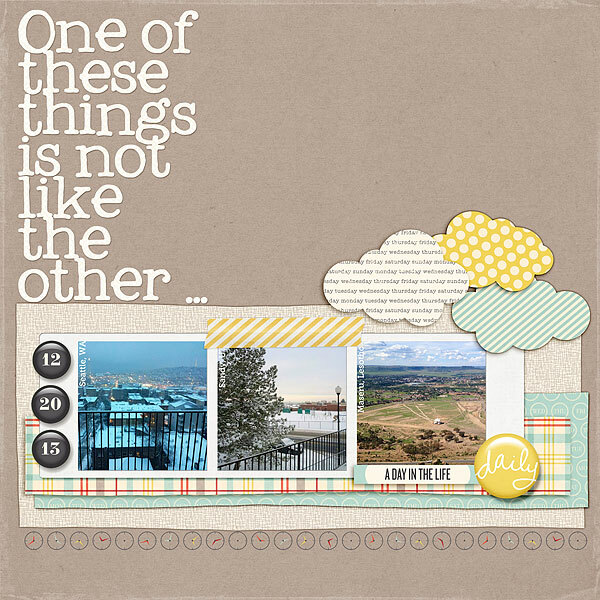 The assignment: Make a 2-page layout with a shelf foundation. 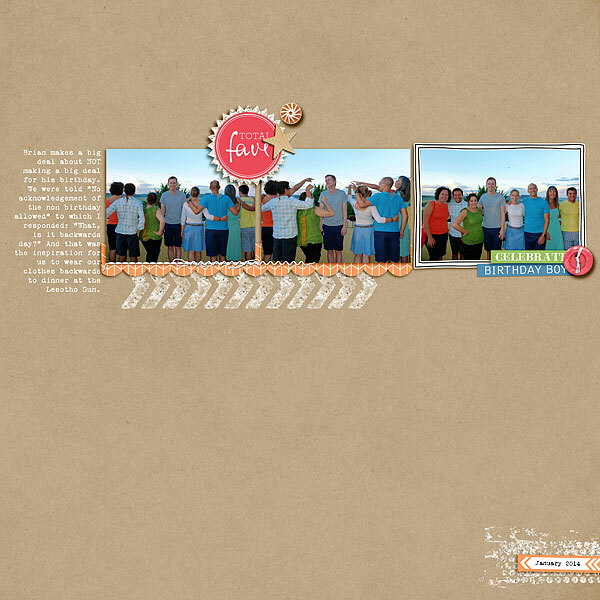 This month the Get It Scrapped Creative Team was challenges to make a page using a pre-made product like patterned paper or embellishment/element with a retro tech motif. Here’s some inspiration on Pinterest. I think of camera motifs as kind of a generic motif that works well on most pages (or at least any page that includes photos!) This is why I thought it would work on this page about the most beautiful places I have ever been. 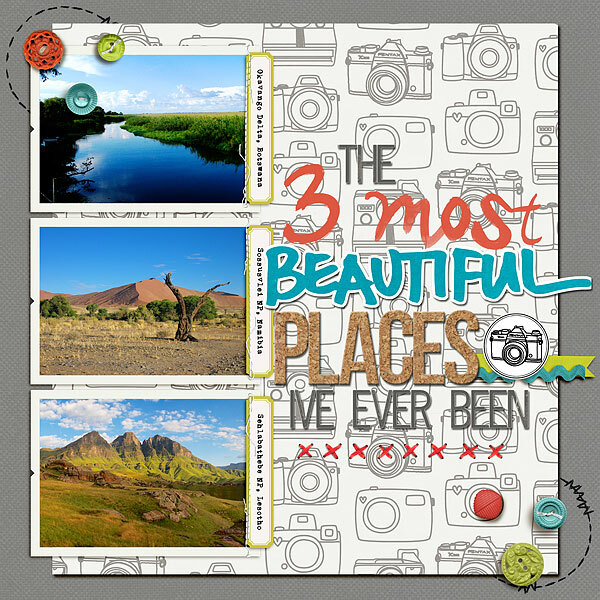 (If you can’t see the labels on the pictures the three places are: the Okavango Delta, Sosussvlei and Sehlabathebe National Park.) I love pages that bring together pictures from different times/events to tell stories beyond just what happened. If anyone ever looks at this page they would get a glimpse of my personality seeing that my favorite places are all out in nature rather than buildings or in the city. For the design the patterned paper was a little busy as a background, so I reduced the opacity with a white paper behind it so that it kind of greyed out the strong camera pattern. I love using glitter styles – premade styles that you can apply to just about anything in PSE or Photoshop. 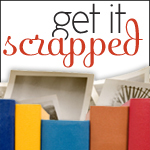 The best part is there’s no mess to clean up – it all falls exactly where you want it! Another great thing about glitter styles is that you can apply them to any layer on the page. For example, on this page I applied it to two stamps/brushes and also the starburst circle that was originally just solid paper. Unfortunately I think that my favorite designer for glitter styles has resigned from designing so I don’t have any recommendations where to find digital styles. 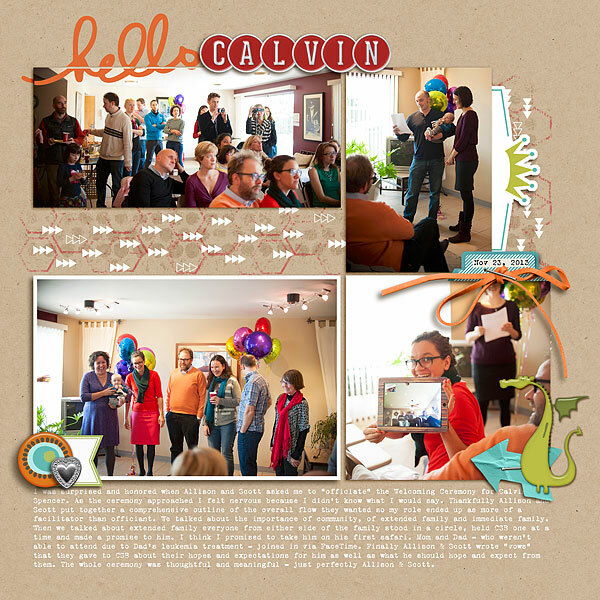 I started a page with the photos from Calvin’s welcome ceremony several times but struggled to find patterned paper to use that wouldn’t compete with the photos. The layered stenciling worked well to replace a patterned paper but without being too bold. Since the stenciling wasn’t as bold as patterned paper I then also had fun with lots of clustering and using elements from different kits. This was a really fun challenge – and not something I would have taken on without the push from GIS! This weeks release by Scotty Girl Design – the Eire Mini Kit – features a St Patrick’s Day/Ireland theme. I think that this is by far the most “themed” product I’ve ever used on a page. I’m not used to sticking primarily to one kit so being on the team has been a great creative challenge for me. It actually helps to get pages done when I stick to a kit rather than foraging through my supplies and trying out lots of options for paper and embellishing. 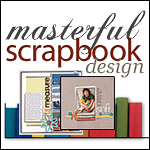 The layout was inspired by the Criss Cross Scrapbook Coach class at Masterful Scrapbook Design. 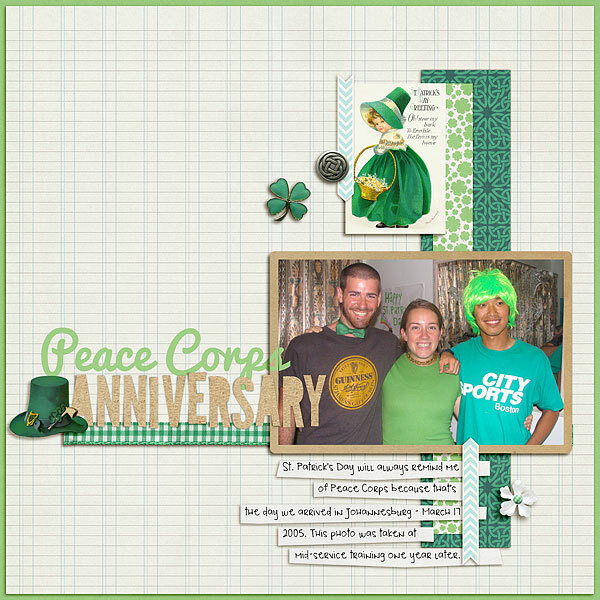 As it says in the journaling, St Patrick’s Day always reminds me of Peace Corps because we arrived in Joburg on our way to Gaborone on March 17, 2005. I was flipping through old Peace Corps pics recently so when the kit came out I remembered that I had this picture from our mid-service training that was held exactly a year later – March 17, 2006 – and we celebrated with a St Patrick’s Day themed party.